Gramya Manthan is a 10-day rural immersion journey with 30 passionate change agents to remote villages of our country. 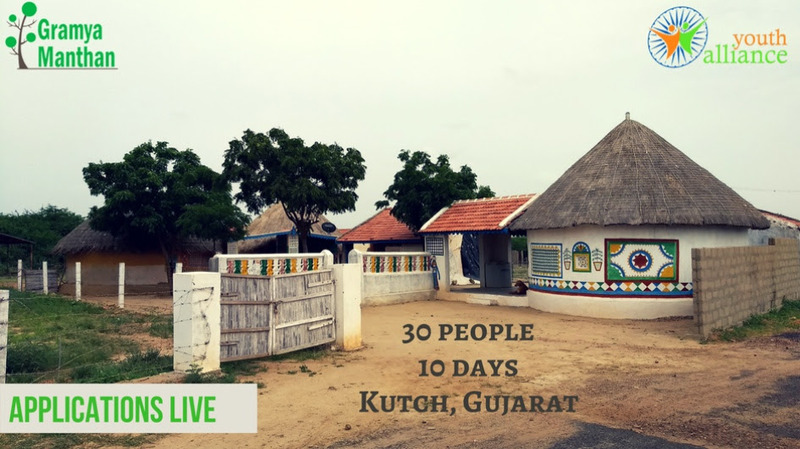 The 8th edition of the program will be happening in villages near Kutch, Gujarat from 22nd – 31st December 2017 hosted by Youth Alliance and is in collaboration with Sabarmati Ashram Trust and ESI, Sughad. The program aims at developing a deeper awareness of ourselves and the world around us by following our curiosity and discovering new understanding by creating a space to learn, to observe and engage with the diverse realities of our world. The idea is also to bring ourselves into a rhythm with the surprisingly complex realities and wisdom of rural life, allowing ourselves a platform to begin to think more holistically and to challenge our preconceived notions about Indian rural communities. Gramya Manthan is rooted in the timeless principles of the circle. • Program is open to both Indian and International applicants. Posted in Ahmedabad, Bengaluru, Chandigarh, Chennai, Coimbatore, Delhi, Fellowships, Goa, Hyderabad, Indore, Jaipur, Kolkata, Mumbai, Mysore, Pondi, Pune, Tanajavur, Tindivanam, Trichy and tagged Community.